active in inlay work since the 1970s. He is well known for his wonderful inlay storyteller belts. Each panel shows a different scene from Navajo life. He uses turquoise, mother of pearl, acoma jet, red coral and orange spiny oyster for his inlay work. This belt is NOS, New Old Stock, vintage but never used. What can you tell me about this Lloyd Bicenti Storyteller Belt? I recently purchased a storyteller belt by Lloyd Bicenti. It has 8 rectangular sections plus the buckle. 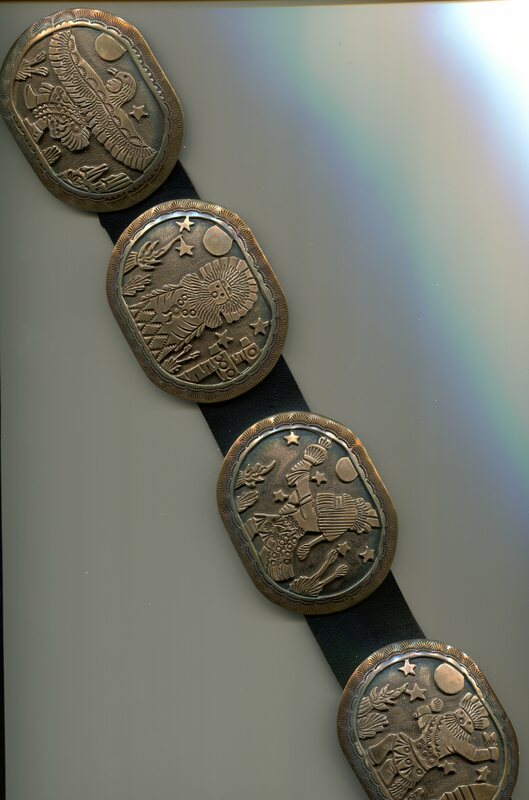 I would like to know what the story is for this specific belt, but would also like to know if there is a source that one could go to about different story belts and bracelets. Your beautiful belt depicts Kachinas, the eagle kachina and the antelope kachina to name just a few that are masterfully represented on the belt. Kachinas represent the forces of nature, human, animal, plant, and act as intermediaries between the world of humans and the gods. 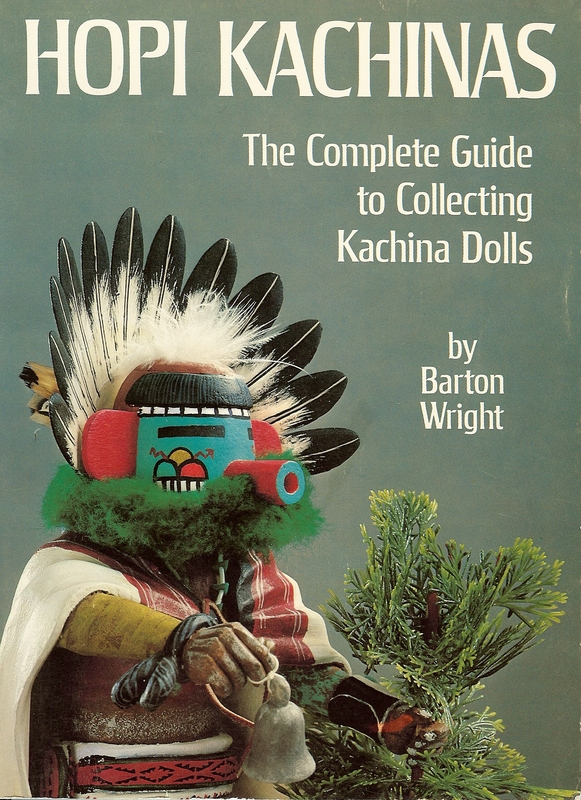 Kachinas play an important part in the seasonal ceremonies of the Hopi, which encompass generations of passed-on knowledge and tradition, and has become the subject of a number of books. The simplified description here is meant only as an introduction. Traditionally, kachina dolls are created by Hopi or Zuni artists. Your belt is made by a Navajo silversmith. 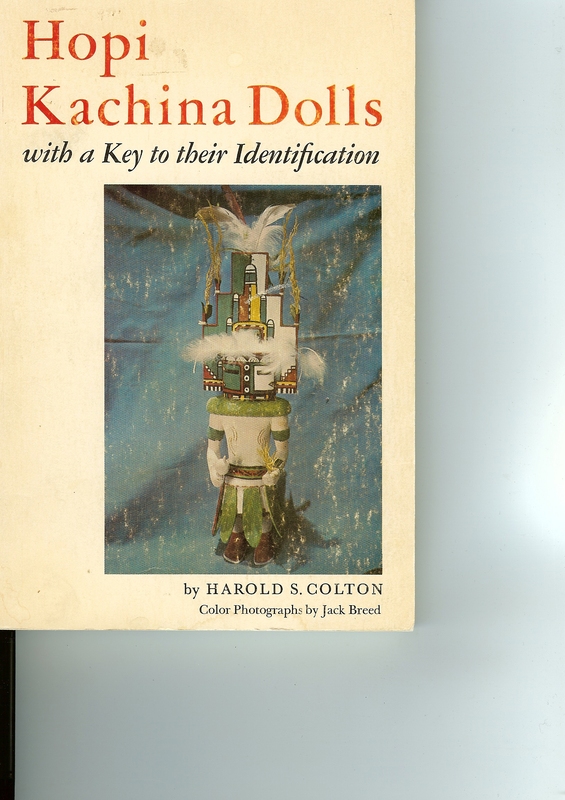 There are many good books written about kachinas – one of the books I show below talks about 266 different kachinas, often with subtle differences between them. To find out which kachinas are represented on your belt, I’d suggest some online or library research. We have a very few kachinas on our website (click on the last photo) but there are websites that devote many pages to describing them. Best of luck with your research and enjoy that gorgeous work of art ! 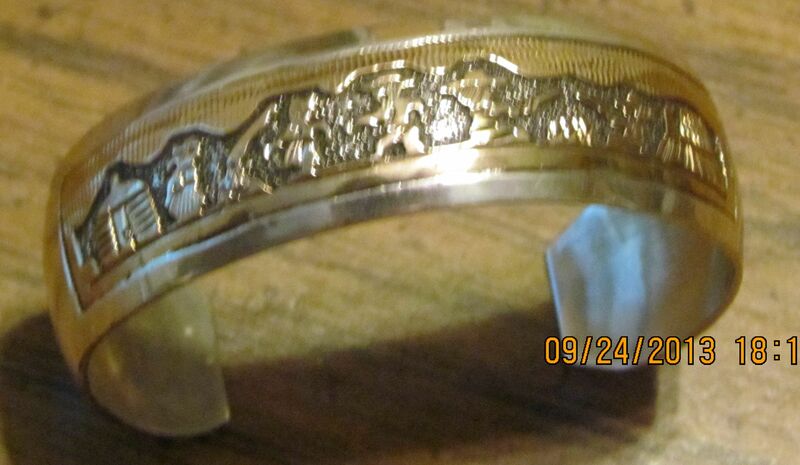 Ten years ago, when I first started working here one of the very first items I listed was a vintage storyteller bracelet by Navajo silversmiths Tom and Sue Kee. I put it in the pawn shop. The bracelet had the hallmark TSK and a hogan. I was told by several people more experienced than me that it was the hallmark of Tom and Sue Kee, Navajo husband and wife silversmiths who specialized in storyteller items. “The Little Book of Marks on Southwestern Silver: Silversmiths, Designers, Guilds and Traders” by Bille Hougart states the same thing on page 181 – that the hallmark is shared by Tom and Sue Kee. And so over the years, I’ve listed barrettes, bracelets and all kinds of things attributed to Tom and Sue Kee. Sylvia, I wish I had been here to talk with you or that you left your phone number……..but anyway, I did some more digging and heard that years ago Tom and Sylvia had made some jewelry for a store and when Sylvia signed for the payment, her signature was misinterpreted as Sue – and it STUCK !! Thanks for bringing this to our attention Sylvia. We have corrected our website listings. The drawing and notes you sent seem like they could have been written by the artist or by a person who the artist was talking to about the storyteller pendant. Shiprock is in the center of the pendant. The four sacred colors are used to depict the four sacred mountains that form the physical border of the Navajo reservation. The mesa designs around the border symbolize the steps up out of the underworld as the Navajo came up from the underworld to earth. All of that sounds in line with Navajo legend and tradition. And the images of the mesas and the Navajo man and woman are very much Jeff James and just like the ones he makes today. Here are some examples of his current work which will help you value your piece. Storytelling is an important part of many cultures. Traditions, rituals, and historic events are passed on orally. 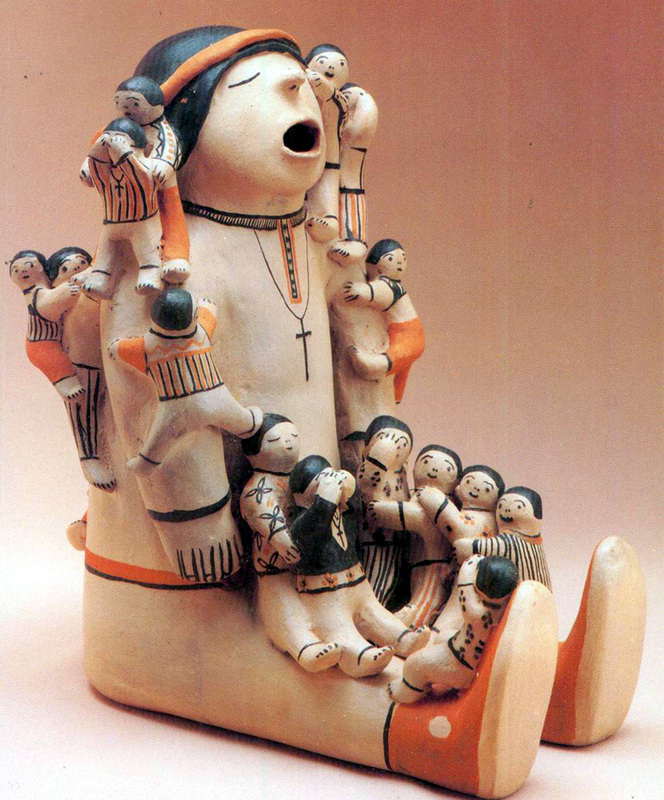 In the first half of the 1900’s Helen Cordero of the Cochiti Pueblo used a storyteller motif in her ceramic pieces. Usually her storytellers would be a Pueblo woman telling stories to a group of children who were gathered around. In this way the language and culture are kept alive. Since the 1960’s a new type of storyteller art emerged, partly in response to the desire of non-Native Americans to have some sort of Indian folk art to display or wear. Storyteller jewelry pieces are generally overlay (see explanation of overlay at the end of this article). Each figure is cut out then placed onto a contrasting background and finished in place. A very painstaking and delicate process. The idea was embraced by Navajo silversmiths and made popular by such artists as (click on the artist to see a sample of his or her work). Here are some examples of a few of those artists’ works. A Day in the Life of a Man, Woman, Horse, Bear and so on……..
Overlay pieces are made of two layers. The bottom layer is a solid sterling silver piece. The top layer has a cutout design. The cutout is placed over the bottom layer and the two pieces are “sweated” together, that is heated so that they become one. The bottom layer (background to the cutout) is usually accented. The Navajo silversmiths oxidize the bottom layer which darkens it. Hopi silversmiths oxidize and etch the background (texturize it) with hashmarks.